Sit back & relax. We’ll take care of uptime, upkeep & upgrades in a proactive fashion. Managed services is the practice of outsourcing on a proactive basis management responsibilities and functions and a strategic method intended to improve operations and cut expenses. It is an alternative to the break/fixor on-demand outsourcing model where the service provider performs on-demand services and bills the customer only for the work done. Would you rather pay $1000 per month for IT or $5000 for management software and $10,000 for business continuity and $5000 per month for an on-site expert and on and on and on…? With the monthly plan, you’ll save thousands every year — or tens of thousands . The cost savings of managed services can be substantial and extend beyond the costs of procurement. Since managed services are priced using a monthly subscription model, your IT costs are predictable. They generally stay the same each month unless you’ve scaled up. As your business grows, you can easily upgrade to increase capacity. If you’re on a month to-month agreement, downgrades are possible, too. Have you ever invested tens of thousands of dollars on technology only to outgrow it or have it become obsolete soon after? With managed services, you won’t be stuck with inefficient technology until the lease is paid off or until you have the resources to upgrade it. 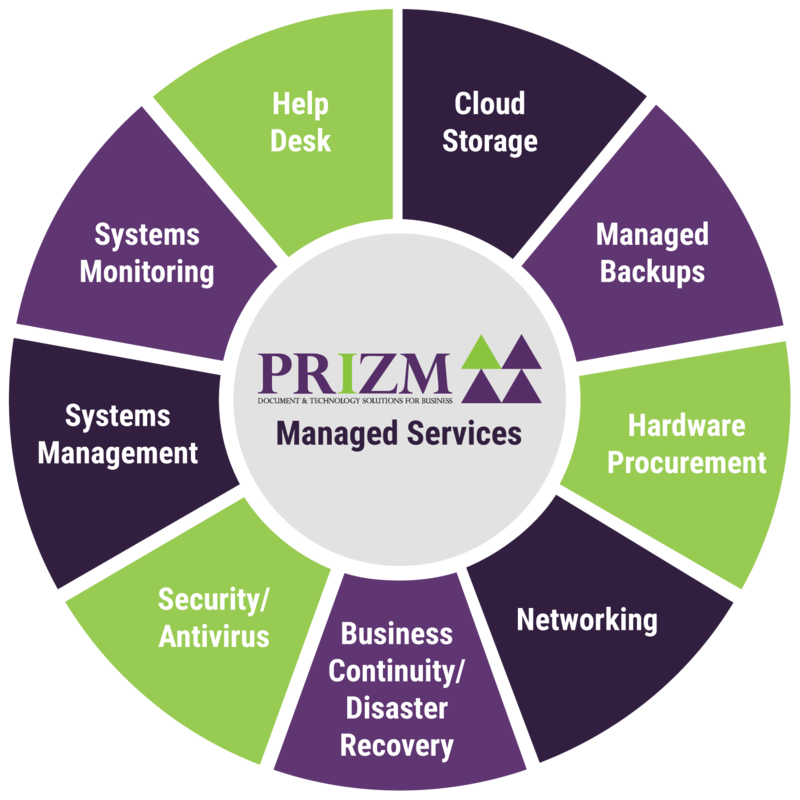 Managed services providers have highly qualified personnel on staff to support their customers in the areas of service they provide such as server management, network security, virtualization, or disaster recovery. What if something does go wrong, even if you subscribe to a managed services agreement? If your managed services include disaster recovery and business continuity, the impact will be minimal. For example, you may never know a server crashed or a hard drive failed because a redundant, mirrored drive immediately kicked in, providing a seamless transition and uninterrupted service despite the unexpected problem. Knowing that your business systems are constantly being monitored, updated, managed, and backed up brings peace of mind. There’s much less stress because even if an outage occurs, redundant, geographically diverse systems ensure that both downtime and potential impact will be minimal. Managed services providers manage the relationships with various vendors under their umbrellas. For example, you may have Internet service, VoIP phone service, and website hosting services through different vendors. However, should you have a problem, the managed services provider works with the appropriate vendor to resolve it. Remote Monitoring & Management is the lifeblood of any Managed IT solution. Our software proactively watches your hardware and software alerting us to errors and predictive failures so we can proactively prevent down-time. Quickly get the help you need! Submit trouble tickets 24/7 to connect to Prizm technicians and we can work behind the scenes to solve your issues. Our remote support is installed on all managed machines so we can quickly get to you when time is of the essence. We provide multiple options for backup and recovery, from simple cloud sync, to full offsite data transfer, to Datto business continuity appliances with instant cloud virtualization. Remote access is a breeze with one of our solutions. Whether slipping away for a quick vacation or wandering your business territory on normal day to day – Prizm makes sure the important info you need is at your fingertips. Our RMM software monitors your network resources for up time and attacks. We partner with some of the top brands in the industry to deliver firewall, routing, switching, and wireless solutions.